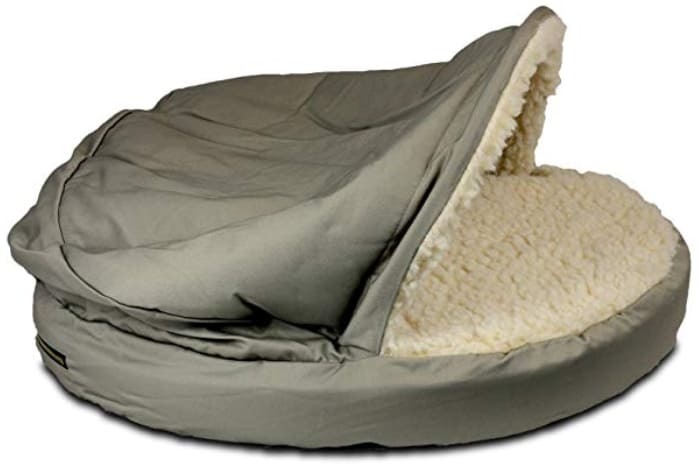 The Ultimate Orthopedic Dog Bed To Keep Your Dog Happy! 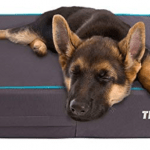 Home » The Ultimate Orthopedic Dog Bed To Keep Your Dog Happy! Are you looking to get one of the best orthopedic dog beds for your furry friend? We spent 27 busy hours closely checking out orthopedic dog beds of all types and sizes. What we discovered can save you hours of research, hundreds of lost dollars, and endless frustration at having chosen a bed that just didn’t deliver as expected. Orthopedic dog beds are important because they provide the ultimate for support and comfort. 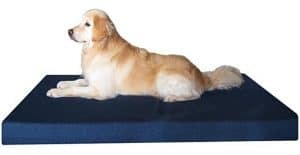 In this article, we review five popular memory foam beds designed specifically to help support your dogs joints and provide an excellent night’s sleep at the same time. Our overall winner as the best orthopedic dog bed goes to this Friends Forever model. There’s a lot of things to like about the Friends Forever orthopedic dog bed/sofa. But top-level support and comfort, providing a good night’s sleep is number one. The poly-fill bolster is soft and plush, providing a comfortable place for your dog to lay his head. Hips and legs are well supported too. If you’re looking for an orthopedic bed that delivers exceptional comfort and a solid nights sleep, so your dog awakens well rested – this is it. It’s also a comfortable lounge that provides a comfy safe haven – whenever your dog just wants to hang out. Level of comfort and support provided. Compared to competitors, this bed seems to offer better-cushioning support and pain-easing comfort. Quality of materials used. The foam used is top-notch. It’s solid, non-aerated memory foam – very similar to the kind of memory foam used on quality mattresses designed for humans. Workmanship. It’s a well-built bed. Stitching is top-quality. There are no snags and the seams are not noticeable. Portability. Since the bed is lightweight, it’s easy to move from room to room. Cool to the touch. The cover fabric can feel a little cold – almost like a cooling pad. But you can easily counter this with a soft blanket placed on top. It smells bad when you first get it. This is to be expected. It’s the chemicals used in the foam and others Factory smells that you’re getting. Simply follow the instructions and air dry it let’s leave it out in the open air for a day or two. Cheap bottom fabric. Buyers love the microsuede material used on top. However, they have far less affection for the low-grade material used on the bottom. As is often the case, manufacturers, cover the parts not clearly visible with a lesser grade of material. But in this case, it cheapens an otherwise stellar product just a little. Well, the bottom fabric may be well-intentioned but it’s not up to the same quality as the rest of this bed. It seems pricey to some – but the value is certainly evident. Dogs with various conditions and health issues seem to really enjoy this bed. They get a comfortable rest and shift around less. Since they’re comfortable, they tend to sleep for longer periods of time. Overall this is a quality well constructed orthopedic dog bed that features quality materials. The main drawback is the price. But if you’re a value-conscious shopper, you’ll appreciate the value you’ll get from this one. The Snoozer orthopedic bed provides a den-like experience for dogs that love to burrow or nest. The 5-inch base forms the foundation. 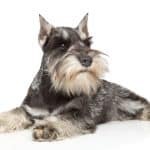 But it’s the raised hood that creates a partial enclosure – something that’s sure to satisfy the natural instinct of dogs who love to burrow. It’s more firm than cozy to do its orthopedic design and its hood hooded top. Just look at the thousands of reviews on Amazon that make this orthopedic dog bed up with the best. This is an upgraded version of the original Cozy Cave. It’s the orthopedic version that has a rigid top on top that partially covers the base and a higher quality of foam stuffing (and more of it) to make it more stable and supportive. Warm Comfort. It’s a bed that is warm and comfortable and supportive. It feels good watching them snooze away in style and comfort. Quality Construction. This one is hand-sewn in America. Not surprisingly, the stitching is tight and of high quality. Easy Cleaning. Unzip the cover to wash as needed. Since the zipper securing the outer cover is made of brass – it’s won’t rust. Plastic support tube. the plastic tube that holds the hood open could be stronger. The one provided is either difficult to get out when washing our can break, rendering the hood virtually useless. Pierced fabric. The plastic tube tends to break through the fabric. The manufacture could solve this problem with a plastic or rubber reinforcement at the corners to prevent the tube from slipping through. Stability. The base is a little unstable. When a dog goes all the way in, it can make the bed topple over. This can scare sensitive dogs and prevent them from going inside again. From your dog’s perspective, this bed offers several options. They can go hide away from a noisy house full of children. Or they can curl up for comfort and enjoy a deep, peaceful sleep. Or, they can simply sprawl out and relax when it’s time to chill. Dogs who love to recognize when things are theirs tend to love this bed. They sleep in it and get away from sleeping on the couch or trying to crawl into bed with mom and dad. The thing to remember is that a better night’s sleep for your dog and supporting its joints means a better night’s sleep for everyone. Here’s another popular orthopedic dog bed. With seven sizes available – from small to jumbo – there’s one that’s the right fit for most any dog. Two excellent features are the waterproof liner plus the 2 external covers – both of which are durable and washable. The waterproof liner plays a crucial role in protecting the memory foam while the zippered, navy blue denim exterior cover is what everybody sees and – it looks great. It’s also machine washable and dryable. Cover strength. The exterior cover holds up quite well. With its blue jean material, heavy-duty zippers, and quality stitching, these beds hold their firmness, keep their shape and easily last for years. It’s soft and stylish – sort of like a pair of comfortable, prewashed jeans. Feels great to the touch looks awesome and looks like it will hold up for some time, while still being comfortable. Extra Cover. having an extra cover extends the life of the bed and provides a different look. It’s also a handy substitute when washing. Washable, Easy Care Cover. The external cover is machine washable and machine dryable. Washing a cold temperature and use the low gentle cycle. Shrinking does occur but it’s less than half an inch, at most. Memory foam mattress. The actual base of the bed itself is 100% memory foam. It’s not just a mattress topper. You get firm cushioning feel that sinks down under pressure and slowly returns to its shape as your dog gets up off the bed. The high density 3.2 pounds density orthopedic memory foam has a similar rating to the mattresses you find in a high-end mattress store. Good for dogs with health problems. This bed provides comfort for injured dogs in recovery, senior dogs, arthritic dogs with joint issues, and those who find it difficult to move around a lot. Bottom material. The bottom of the bed is covered with a black nylon-like material with tiny rubber stoppers to help the bed stay in place as the dog jumps on and off. Could be more of a heavier-duty fabric. If bed wetting is a regular occurrence you can add an extra layer of protection. After washing the covers, it’s easier to have two people reassemble the bed. It’s sort like changing sheets on your bed. While some find it an easy routine task, others struggle. Seems a little easier to have two people do it. When you get the right size bed, your dog can spread out comfortably. 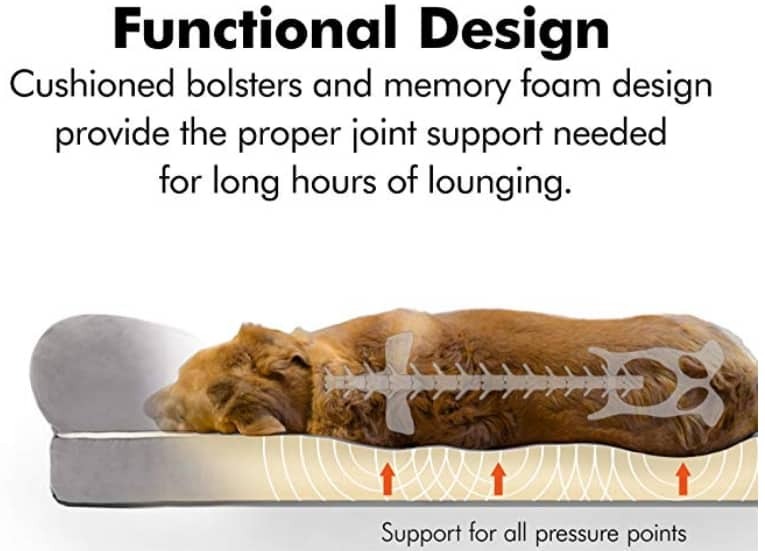 The Dog Bed For Less Premium Orthopedic Memory Foam model provides cradling support that seems just about right for a sound sleep. Your dog might also seem to be a little less stiff after a night on a mattress of this quality. Give it the human test when you first. Go ahead and lie down with your back on the mattress. Is it comfortable for you? If so, your dog will likely think so too. Two and three years later, buyers report the bed still being in good condition. And this is even after washing the cover several times over that time frame. Another common sentiment shared among buyers was that they were happy with this bed as it replaced the need to buy several beds over time. That saves your dog aches and pains and you some cash. Getting this bed puts you in a position where you can’t lose! The Barksbar orthopedic dog bed features orthopedic foam as the base plus an extra comfy cotton padded trim cushion and a non-slip bottom. This may be a bed you want to consider if for no other reason than the positive reviews and the fact that it’s priced more economically than some of the others in the market. With its sleek, luxurious and quilted design – this one is sure to look impressive in any family room. The non-stick rubber backing on the bottom ensures that the bed won’t move around easily on wooden or tiled floors. Good for aging dogs. It’s made to provide a comfortable sleep experience with generous support. The interior sleeping space is about 24″ x 36″. It’s a good choice for dogs of any age-related conditions. In fact, those with arthritic problems may find this bed particularly comforting. Cleaning is easy. The BarksBar bed is easy to clean and maintain with a removable and machine washable cover. When washing, be sure to run it on a gentle or delicate cycle and air dry only. Conversely, you can avoid machine washing by simply spot cleaning it periodically. It’s easy to wipe down or vacuum off. Support and Comfort. BarksBar is another brand that provides human-grade orthopedic memory foam on their dog beds. This provides strong support and joint relief – exactly what a lot of dogs need. Deep cushioning provides pressure relief on the joints and cotton padded walls can contour to the neck and head for optimum comfort and support. Made of polyester, the plush cover is ultra soft and. And features a luxurious, quilted design that can match or blend with any homes interior. It’s not tear-proof. Well, the bed is made of good quality, it’s not rip-proof and some dogs have been able to tear holes in it and expose the foam underneath. That’s something nobody wants to happen and a good way to help prevent this is to throw a small blanket over the top of the bed. It’s durable and roomy enough for many dogs but not all. The rim flattens out. The cushioned rim or bolster could be better reinforced, so it doesn’t flatten out as quickly as it does. No bed is truly indestructible, and I would imagine that repeat digging in pine will eventually tear the fabric on the cover. For dogs that like to fluff up their beds before they settle down, we recommend using a blanket on top of this bed or any other non-heated bed. That way they’re doing their fluffing and digging on the blanket rather than the bed itself – so they’re not making direct contact with their nails. This is a well-made product. It’s designed in the USA and manufactured in China. The extra thick bottom pad and durable construction means it should last over the long haul. The quality of the fabric is good as is the quality of the zippers. The BarksBar is a great choice for an orthopedic dog bed and comes highly recommended. The Dog’s Bed Premium Orthopedic Memory Foam Waterproof bed is most suited to dogs who really stretch out when they sleep. While it’s appropriate for any age and almost any size, those who are most likely to appreciate it are dogs with any kind of health condition, where extra support can really help them get a better night’s sleep. With 6 inches of total foam as its base, this bed provides uniform and balanced support, And it should stand the test of time. Memory foam base. Excellent medical grade orthopedic foam provides therapeutic comfort for older dogs in particular but any dog including those with arthritis pain, stiff muscles, hip dysplasia, and arthritis. It contours perfectly to support the dog and provide a sound night sleep. Machine washable. Both the inner liner and the outer plush cover can be machine washed on a delicate cycle. They should never be washed at a high-speed or quick wash cycle as it could damage the fabric. You can machine dry on the lowest possible setting, but air drying is highly recommended to keep your covers looking like new longer. Product design. Clearly, some thought went into the cover dimensions. After washing and drying repeatedly, the cover continues to be easy to reinstall. The water repellent cover encasing the foam is another added plus. Pricey replacement covers. While covers are available, they are a bit pricey. Instead of requiring regular cover replacements, it would’ve been better for the manufacturer to supply a more durable outer cover, one that doesn’t need replacing nearly as often. The top isn’t very soft. The top is not as soft as the tops on other beds. But you could always add a layer of softness with a blanket on top. 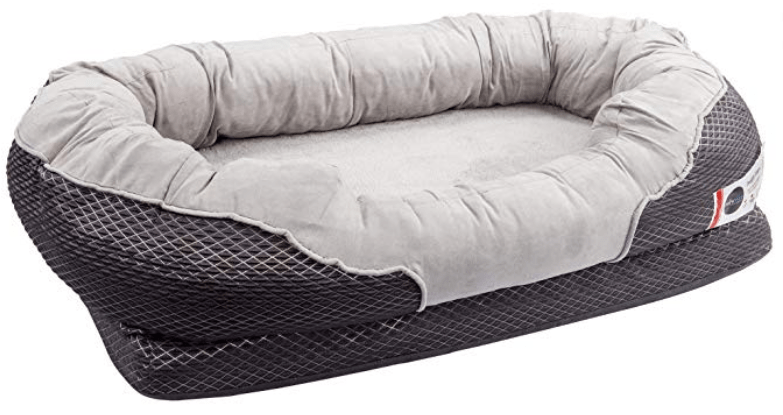 The Dog’s Bed Premium Orthopedic Memory Foam Waterproof bed is the bed you want if you are looking for a long lasting bed. It’s going to be plenty firm and really work well with those dogs that have age-related arthritis or just injuries in general. I like this bed for its ease of use and superior quality mattress. Why Is Memory Foam Great For Dog Beds? Memory foam is a must for an orthopedic dog bed. It was first developed back in the 1960s by NASA as they explored options for aircraft seating. Memory foam has continued to evolve, and today’s products are softer and extremely comfortable. But there are various grades of memory foam each providing a different level of comfort and support. These beds are also an ideal solution for any dog prone to accidents, or aging dogs with leaking bladders. With its waterproof insert and fully machine washable cover, you shouldn’t have to worry about damaging the mattress. You want to make sure the memory foam does not get wet or it will continue to have a scent that attracts that does not repel further accidents. Dogs have such a strong sense of smell that they can detect even after numerous washings and will continue to be there. Overall these dog beds are somewhat resistant to chewing and leakage. They are comfortable without being too squishy. Their thick and sturdy and get your dog up off the floor. If your dog has been diagnosed with arthritis these beds will definitely help. For all-around comfort durability and resistance to damage through normal use, these beds are a solid investment. With balanced weight distribution, they are particularly helpful to dogs recovering from injury. These mattresses keep them from having to put excess weight on the bad leg, for example. Most dogs within the recommended weight won’t sink to the bottom and will be fully supported. There’s no question these are luxurious dog beds that molds to your dog’s body, evenly distributing their body weight providing a much more restful experience. And once your dog gets up off the bed the mattress expands to its original shape and size time and time again. A good quality orthopedic dog bed is one that provides comfortable support. You want a bed that cushions and relieves pressure points. Options include beds with airflow channels to promote air circulation and provide a cooling effect. And some beds feature strong, moisture resistant fabric that can outlast other models. One key component of a bed that provides both solid support and ultimate comfort is memory foam. It can be the lone component of a dog bed or stacked on top of a supportive bottom layer, just like some of the best mattresses designed for humans. A strong support structure provides a solid foundation. And the right amount of memory foam on top helps to relax joints muscles and bones – easing your dog’s pain and discomfort. Just like in humans, the dog’s ability to naturally repair joints slows down and arthritis can set in. While larger, bulkier dogs tend to be more susceptible to arthritis pain, it happens in virtually any breed. 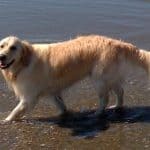 Potential warning signs are seeing your dog limping around or finding it difficult to climb stairs – or even to get around in a general sense. Maybe he or she seems more inclined to rest when previously she would be more active. It’s scary sometimes, particularly when it seems like they can’t even move. One of the best things you can do as a dog parent is to provide soft memory foam cushioning that evenly distributes their weight and provides maximum support. This creates a superior cushioning effect you just can’t get from other materials – no matter how soft and plush they seem to be. This is probably the main reason people are looking for an orthopedic dog bed. You have a dog with arthritis or some sort of joint issue and you just want them to be comfortable. If you stray away from an orthopedic dog bed then you are probably going to see their condition worsen, unfortunately. If you get them an orthopedic dog bed you are more than likely to see an improvement or at the very least, a slower deterioration. This is something I find is most overlooked by owners. If you can start your dog on an orthopedic dog bed, you can reap even more rewards. You are going to invest in a lot fewer dog beds because they won’t fall apart or turn into nothing after a short time. You are going to see less joint issues like arthritis or at least see a significant delay. Preventative care is something you hear a lot about now for humans, but it’s great for dogs too! 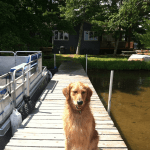 Imagine prolonging your dog’s active lifestyle and pain-free for a number of years. It’s just like choosing a healthy dog food choice or making your own vs. buying the cheapest dog food you can find. Finally, if you start a younger dog on an orthopedic dog bed, there won’t be the transition period of getting used to a new bed. I like this aspect a lot because one of the biggest complaints I saw on any of our mentioned beds was getting their dog used to it or to like it. Start them young so they know what a good bed is and you won’t have to worry about getting them used to a more firm and supportive bed. Okay, this is probably the biggest drawback to an orthopedic bed. People don’t like to spend a lot of money on a dog bed. I completely and 100% understand that. However, I’m always down for spending a little more to save in the long run and I bet you are too. While an orthopedic dog bed CAN be more expensive than a polyester or cedar filled bed, it is going to last MUCH longer. 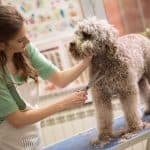 Beyond it lasting longer, you are going to be able to save money taking your dog to the vet’s office as often. I know from experience how expensive a leg surgery can be on a dog. I also know that even going to get a diagnosis for arthritis can be expensive! There’s the check-up, the x-rays, the blood work. The list goes on. Vet’s know how to make money. I’m not against that, but I also know that it’s hard to justify spending that much on your dog sometimes. Getting an orthopedic dog bed can save you money in a couple of different areas. It’s worth shelling out a little extra from the get-go. Stay away from buying beds over and over and over again! It’s not worth it and your dog will thank you for getting a good bed to start with. After investigating dozens of different options, we’ve settled on our top 5 picks. For the best overall orthopedic dog bed, you can’t go wrong with the Friends Forever Lounge Sofa. If the value for money is your most important consideration, we recommend the Snoozer Cozy Cave is a solid choice. Otherwise, they are all up for grabs with supreme quality and excellent pricing. Choosing the dog bed that’s right for you and your pet is a personal decision. Any of our top five orthopedic dog beds come highly recommended. Choosing one of our picks instead of another brand will leave you as an owner feeling satisfied and your dog will be happy, too. There isn’t a wrong decision here. Some beds are better for your dog and their personality or quirks than others, though. I would encourage you to check out the individual reviews on any bed that piques your interest. For the prices, these 5 are great beds especially for dogs with leg, hip, or mobility issues. They are more firm than soft to the touch. They do provide ample support. Plus, you can use them for preventative care. That seems to be a point a lot of people miss. If you get one of these beds for your dog from the start, they are less likely to have issues later on. It’s going to save you money at the vet and on other dog beds in the future. While buying an orthopedic dog bed might not have been your top priority or even a thought in your head when you bought a dog, it will be now. You have seen the benefits throughout this article from cost savings to orthopedic support and more. I highly recommend choosing an orthopedic dog bed over a regular bed no matter what size, shape, or age your dog is. It’s a great gift to yourself and your dog.